20110823-DSC_4972.jpg, a photo by Andrea Pokrzywinski on Flickr. This is Bethel’s version of running water. 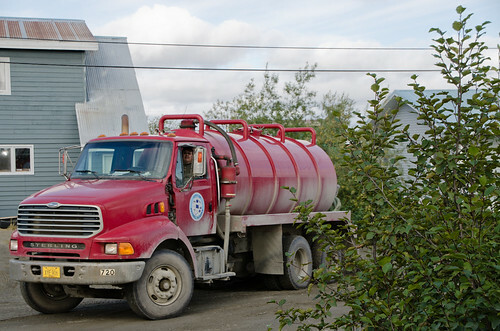 A truck comes and delivers up to 1500 gallons of potable water into our clean water holding tank each week. Then a different truck comes to collect our waste water on the same day too. There are some parts of town that have piped water. But the pipes must be run above ground and insulated.